Udupi, Nov 26, 2017: M.B. Puranik, Vishwa Hindu Parishad (VHP) leader, said on Saturday that a Shobha Yatra as part of the Hindu Samajotsava would be held at Udupi today, Nov 26, Sunday. 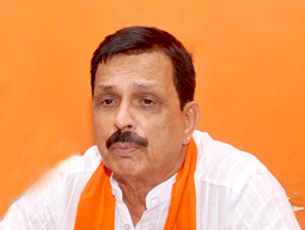 The aim of the Shobha Yatra was to enthuse the cadre of the Bajrang Dal and also the youth. Addressing media Puranik said that the Shobha Yatra would begin from the Jodu Katte here at 2.30 p.m. However, the main yatra would commence from the Daina Circle. The yatra would culminate at the venue of the Hindu Samajotsava at the MGM College Grounds at 3.45 p.m.
“While those in the procession would raise patriotic and religious slogans, the youth should not indulge in any provocative sloganeering,” he said. The designated spots for vehicle parking had already been made known and people should follow the instruction. People living nearby should avoid bringing four-wheelers or two-wheelers as this would congest the path of the Shobha Yatra. Though Uttar Pradesh Chief Minister Yogi Adityanath was expected to attend and deliver the keynote address at the Hindu Samajotsava at 4 p.m., he was unlikely to come as he was busy with elections in Gujarat. For people coming from Dakshina Kannada district and the southern parts to the Hindu Samajotsava, lunch arrangement has been made for them at Udyavar, while those coming from Kundapur and northern parts, can have their lunch at Kallianpur, Mr. Puranik said. Ban on liquor sale today: The Udupi district administration has banned the sale of alcoholic beverages in the entire Udupi taluk today Nov 26, Sunday on account of Hindu Samajotsava. A press release on Nov 25, Saturday said that since nearly one lakh persons and important leaders were expected to participate in the samajotsava, in the interests of maintaining peace and order, all liquor shops would be closed from 6 a.m. to midnight today, Nov 25, Sunday.